Second year Interdisciplinary Arts & Media student Sid Yiddish will be appearing live on The Mancow Experience television show, Thursday, August 14, 2014 between 7:00 – 10:00 a.mm, Channel 50 WPWR in Chicago & radio station, The Blaze, 1530 AM. Yiddish’s improvising orchestral unit, Candy Store Henchmen, have been featured in a new podcast interview, for the archival series, Notes And Bolts, hosted by Kriss Stress. To listen or to download the interview click here (by right-clicking onto the link). Yiddish will perform on live WRRG 88.9 FM the Candy Store Henchmen, Tuesday, August 26, 2014 from 10:00 – 11:00 p.m. WRRG broadcasts originate from Triton College, in River Grove, Illinois. To listen online, go here www.tunein.com (look up WRRG ). 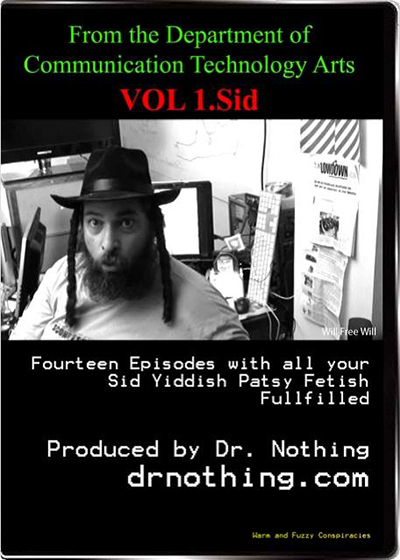 Furthermore, Yiddish also appears in a new DVD collection released by Chicago record label Aleatory Records, highlighting his conspiracy humor short film work for The Department of Communication Technology Arts(DOCTA), the film arm of Multikulti, a community, arts and activist center in Chicago from 2012-2013, entitled: Volume 1.Sid: Fourteen Episodes With All Your Sid Yiddish Patsy Fetish Fufilled.